Wow! NEW! Honeymoon & Anniversary romantic log cabin with river views! Pigeon forge-Wears Valley Cabin on the River. Fishing available! Stay... VIEW NOW. Pigeon Forge Winterfest is a celebration of the holidays with everything from magical winter light displays to captivating Christmas shows! As soon as you arrive into Pigeon Forge, you will be amazed by the incredible winter wonderland that has been created by over 5 million lights! The spectacular light displays shine from now until early February, so come early to get into the Christmas spirit or enjoy the lights well into the winter season. Another thing to do during the Pigeon Forge Winterfest is Dollywood’s Smoky Mountain Christmas, which features wonderful holiday performances, a 50 foot video motion Christmas tree, Rudolph and Friends, and a nightly Parade of Lights! As if that doesn’t sound enough, many of the popular theaters throughout town will be offering special Christmas versions of their live shows! The best way to enjoy the beauty of the holiday light displays throughout Pigeon Forge is on the Winterfest Driving Tour of Lights! This delightful driving tour runs along the Pigeon Forge Parkway and features bear, fox, deer and other critters that are native to the Great Smoky Mountains! You will also have the opportunity to see some of your favorite fairytale characters such as Mother Goose, Humpty Dumpty and the giant clock from Hickory Dickory Dock. Another highlight of the tour is a 60 foot tall tree filled with colorful lights and sparkling ornaments that has been topped off with a twinkling star! You can pick up a free Winterfest Driving Tour of Lights brochure and map at Pigeon Forge Welcome Centers or at the Pigeon Forge Trolley Office. The best place to stay near the Pigeon Forge Winterfest is at Acorn Cabin Rentals! We have a wide range of beautiful cabins to accommodate your needs, ranging from 1 bedroom cabins for a romantic holiday getaway to the mountains to 6 bedroom cabins for a Christmas family reunion! We even have a selection of pet friendly cabins in the Smoky Mountains so that you can bring your favorite furry companion along for the fun! While staying with us, take advantage of the fully equipped kitchen where you can prepare everything from light snacks to a full holiday meal with all the trimmings! 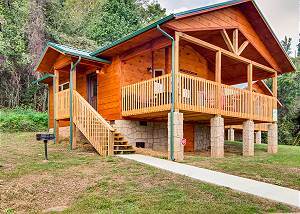 Our cabins also feature all types of fantastic amenities for your comfort and enjoyment, including scenic views, soothing outdoor hot tubs, fireplaces, game rooms and more! Come find out for yourself why so many guests love spending the holiday season at Acorn Cabin Rentals! Check out all of our cabins in the Smoky Mountains today to plan your vacation near all the activities of the Pigeon Forge Winterfest celebration! We hope to see you soon at Acorn Cabin Rentals!